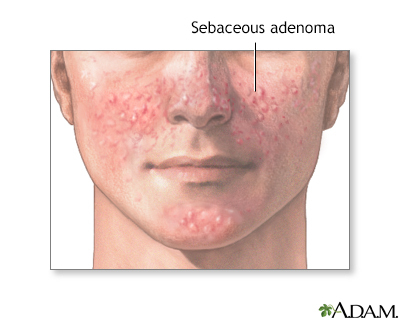 A sebaceous adenoma is a small bump. There is most often only one, and it is usually found on the face, scalp, belly, back, or chest. It may be a sign of a serious internal disease. If you have several small bumps of the sebaceous glands, this is called sebaceous hyperplasia. Such bumps are harmless in most cases, and often found on the face. They are not a sign of serious disease. They are more common with age. They may be treated if you do not like how they look. 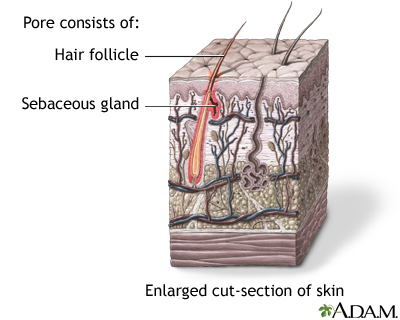 Sebaceous adenomas are small, yellow bumps containing sweat glands which are usually found on the face.